The European Parliament will vote today on regulations that will cover legislation on baby foods and formulas in all EU Member States. CLICK HERE for a plan of what will happen now. 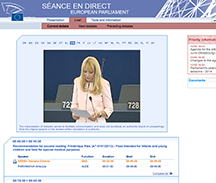 CLICK HERE for a report on the MEPs vote to stop a misleading health claim. CLICK Here for a report in the Irish Times. Baby Milk Action, the International Baby Food Action Network and the Baby Feeding Law Group, have been advocating an overhaul of these regulations for over 20 years. If these regulations are adopted, the specific Directives relating to all baby foods and formulas will have to be revisited and strengthened. Tomorrow’s vote is expected to be a Rubber Stamping of the proposals which were voted on unanimously at the meeting of the Environment, Public Health and Food Safety Committee (ENVI) on 29th May. Thanks to the strong support from Member States and MEPs the new proposals do contain several new safeguards. 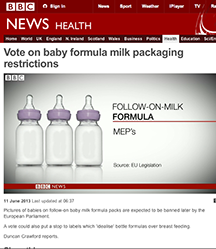 For example, there should soon be tighter controls on the labelling of follow-on milks (baby pictures and idealising text will be banned), stricter controls on foods claiming to be ‘for special medical purposes’ including formulas for pre-term babies, increased transparency, the use of the Precautionary Principle and more democratic oversight – all NEW ingredients will have to be reviewed by MEPs. Currently manufacturers are allowed to add any ingredient – provided they submit a label to national authorities, and only have to provide evidence of efficacy if this is requested. Follow-on formulas’ if not invented, have been used by the baby food industry to get round the restrictions that were adopted by the World Health Assembly in 1981. The International Code of Marketing of Breastmilk Substitutes and the World Health Assembly has since 1986 considered them to be unnecessary since if babies are not breastfed and need formula they can continue to have infant formula after 6 months. The EU has allowed these products to be promoted aggressively for decades simply because of the commercial pressure to do so. We did not get all the changes we wanted, such as a ban on advertising and promotion of follow-on formulas – but the new legislation is an important step in the right direction and should change the way that the EU interacts globally. Following the adoption of Parliament’s first reading position by the plenary on 14 June 2012, informal negotiations started with the Cyprus Presidency with view to reaching an early second reading agreement. After three rounds of trilogue, Parliament’s and Council’s negotiating team reached agreement on the file on 14 November 2012. The text of the agreement was presented to the ENVI Committee for a vote of approval on 18 December 2012, and approved by an overwhelming majority. On the basis of the committee’s approval, the Chairman of the Committee undertook in his letter of the same day to the chair of Coreper to recommend to the plenary to approve Council’s position at first reading without amendment. Following legal-linguistic verification, Council adopted its first reading position confirming the agreement on 22 April 2013. No special (sub) category is created for formula for pre-term and low birth weight infants; it is a case-by-case decision, based upon the medical condition of the infant, to decide whether he should be fed on medicated formula. Such medicated formula falls under the category of food for special medical purposes. However, the compromise recognises the need to adopt specific requirements for the food for special medical purposes developed to satisfy the nutritional needs of infants. Furthermore the text ensures that requirements such as pesticides residues, labelling, presentation, advertising, promotional and commercial practices for infant formula which should also apply to formula for pre-term and low-birth-weight infants, will be reviewed. The Commission, after consulting EFSA, will draw up a report on the necessity of special provisions for milk-based drinks and similar drinks for young children. The report shall consider, among others, the nutritional needs of young children, the composition of such drinks, and whether those drinks have any nutritional benefits. The report may be accompanied by a legislative proposal. The compromise accommodates Parliament’s demand for referring to the definition of engineered nanomaterials as set out in FIC, as well as for requesting scientific evidence based on adequate test methods for engineered nanomaterials to demonstrate that the substance complies with the inclusion criteria. Substances falling under the scope of the regulation on novel food and novel food ingredients (Regulation (EC) No 258/97) may be added to special food only if they comply with the conditions of both the Novel food regulation and the present regulation. Labelling, presentation and advertising of infant formula shall not include pictures or text which might idealise the use of the product. With regard to follow-on formula, the prohibition relates to labelling only. Due to constitutional concerns voiced by some Member States over those restrictions, a recital is included into the text to clarify that the provisions of the regulation do not affect fundamental rights and the freedom of expression. Guarantees are built in to protect consumers from misleading information included in or expressed on the labelling, presentation and advertisement of food; dissemination of information by food business operators to healthcare professionals is allowed. The text in the recitals calls for setting maximum residue levels at the lowest achievable level, taking into account good agricultural practices and other sources of exposure; and for establishing limitations or bans of certain pesticides contained in the current secondary measures should be taken into account in the future delegated acts. Further provisions are included into the articles to ensure that requirements such as pesticides residues, labelling, presentation, advertising, promotional and commercial practices for infant formula will be reviewed. 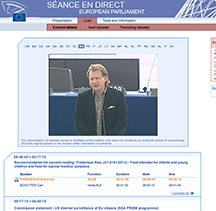 As a further guarantee, the Commission made a statement on the limitation of use and ban of certain pesticides, with particular attention to pesticides approved as candidates for substitution under the Plant protection products regulation. 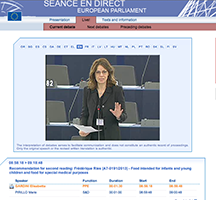 During the negotiations Parliament achieved that the list of substances which might be added to the food would be included into the basic act as an annex, and would be updated in the future by delegated acts. The three lists of substances existing today have been merged into a single list to preserve the status quo. Furthermore, the compromise accommodates Parliament’s request that the list specifies which categories of substances might be added to which category of food; and that not all substances may be added to all categories of food.